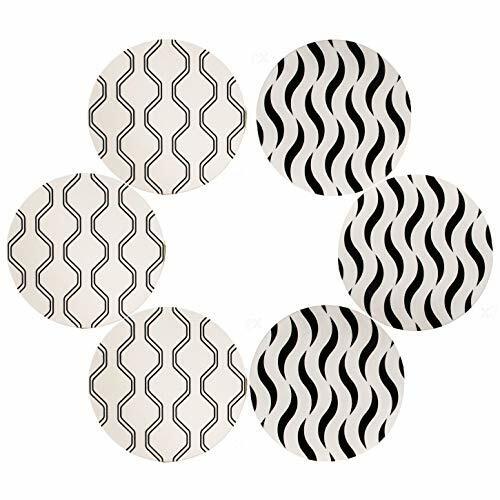 DECORATIVE COASTERS Add a splash of style to any table, counter, or desk with the Urban Mosh ceramic coaster set. With 6 elegantly designed geometric coasters, you can protect any surface from water rings, coffee stains, and condensation. Fancy up any home, office, restaurant, or bar when you place your modern chic coasters out for people to use and admire. UNIQUE DESIGNS We've included two unique geometric designs to add interesting to look at protection to your home and office decor. The geometric patterns are designed with two stylish a patterns: hypnotic wavy and chain link. The wavy design is so interesting to look at your might find yourself staring, and with the contrast almost looks like it has 3D depth. The chain links are a cool never ending pattern your eye loves to follow. WATER ABSORBING Unlike metal or silicone coasters that keep moisture on the surface, Urban Mosh coasters are made from absorbent ceramic stone to trap condensation. The high quality ceramic creates a sturdy, durable surface while protecting you furniture from being stained or warped. Enjoy a hot cup of joe or soothing tea without worrying about ruining your favorite table! SLIP RESISTANT PAD Don't use coasters that slip and slide the second you place a drink on them. Our coasters are sturdy with thick, cork backing to ensure they stay put while adding another layer of protection so your tables and furniture won't get scuffed or scratched. 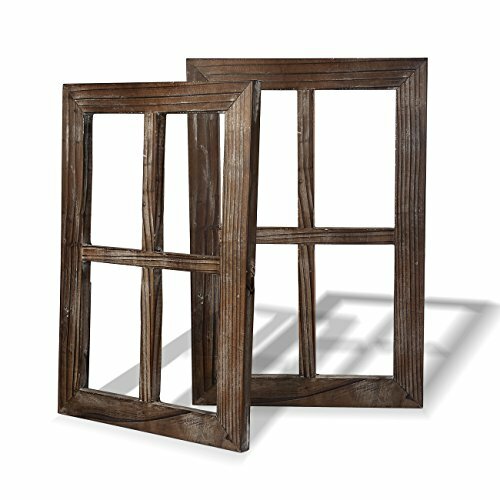 Use them indoors on coffee tables, desks, and countertops or use them outdoors on glass patio tables and wicker ottomans during family cookouts and other special events. FOR EVERYONE You'll love Urban Mosh coasters so much you'll want to share them! Get a set of our vibrant coasters for yourself and for a family member or friend. These sets come in convenient storage box packaging so they're gift ready! They make great housewarming gifts and are sure to be a hit for any event. 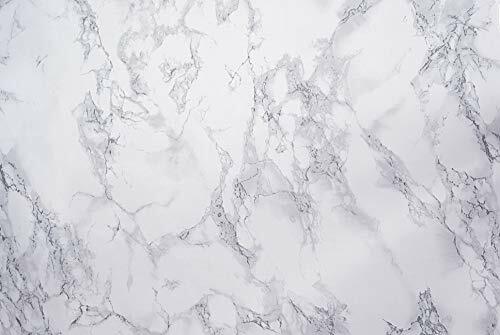 Marble Grey/Marmi Marble is a light grey veined marble colored self-adhesive film. Apply it to tables, cabinets, walls and more to transform that old surface into a beautiful grey marble surface. Makeover, renovate, customize, whatever you want to call it, D-C-Fix self adhesive vinyl is your perfect solution when it comes to creating something new out of something old. Damaged desks or table tops can look as good as new, cupboard doors can be modernized, plain flat surfaced furniture can achieve a custom made, high end look. D-C-Fix self-adhesive films are a collection of affordable home d cor solutions, which allow you to change an appearance and inspire a custom design with minimal effort. D-C-Fix's solvent-free films boast unique designs and patterns that can be used for home and office makeovers. Express your individual design ideas quickly and easily by applying the film directly to almost any flat surface for instant, beautiful and long lasting results. Application is easy: 1) Cut the film to the required size using the handy grid on the back. 2) Gently remove the backing paper. 3) Apply to any dry, flat surface using a D-C-Fix smoother or cloth. Surfaces covered with D-C-Fix product can be washed and maintained with warm soapy water and can be easily changed for new designs. D-C-Fix products can also be used for arts and crafts, decorations, labels and much more. Utilize D-C-Fix self-adhesive films for your next Do It Yourself project - the design opportunities are only limited by your imagination! 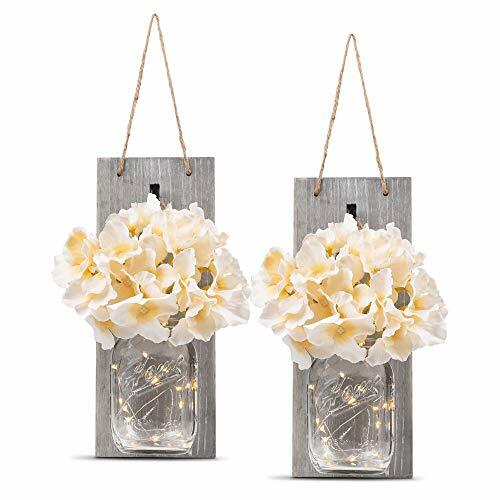 Handmade Mason jar wall mount board with mason jar light fixture and Beautiful Ivory Hydrangea flower included to give off that perfect lighting! All natural handpicked wood, decorative mason jar with natural rope to secure the jar in place comes completely assembled and ready to hang on the wall. It makes an excellent gift for your friends and family on any occasion; anniversary gift, birthdays, holidays, Christmas, bridal shower, weddings and housewarming party etc. The diameter of the bottle is 3", Height 5". ***This is a handmade item so slight variations may occur. The items you receive may appear darker or lighter than the picture or the wood grain might be different. All of our Mason jar lantern are handmade and distressed, no two will be exactly the same, that's the beauty of handmade. We are a value for money destination of daily used items and home decorator items. Good Quality Products and Genuine Customer Support - 30 Day Money Back Guarantee. CLICK the 'ADD TO CART' and ORDER your Wooden Mason jar lighting decoration before this LIMITED TIME OFFER expires for New Release. Vintage Mason Jar Wall Sconces - can make your home and garden feel beautiful. You will love hanging these on your hallway, kitchen, any room wall. Or giving them as a special gift for any one who loves rustic mason jar decor. Soft glow - Mason jar with string lights emit a magical, warm glow, display peace and harmony in your house. Multipurpose - Perfectly use as mason jar night light, mason jar living room decor, mason jars bathroom decor, mason jar kitchen decor, mason jar lights outdoor, mason jar wedding decor, and also suited for party, Christmas, garden, etc. Easy to mount - You just need to drive a nail on the wall (nails not included), then hang the rope up. Capture the flair of old fashioned cinema with the new Cinematic Light Box from SUOMEI. Whether it's setting the mood for a movie marathon, asking Santa to Stop Here! 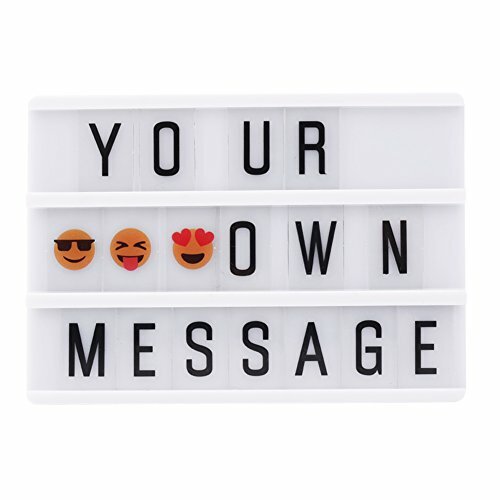 Creating a talking point at a party or sending your kids secret messages, this gorgeous customizable light feature will be sure to add to the atmosphere of every occasion. CUSTOMER GUARANTEE:We provide worry-free 1 year warranty .If for some reason you don't want it or you are not satisfied,then just let us know ,We will solve it till your 100% satisfaction. EXPRESS YOURSELF IN ANOTHER WAY Personalize and create your own messages! Use it for your business as a sign to advertise your newest product or your latest sale. 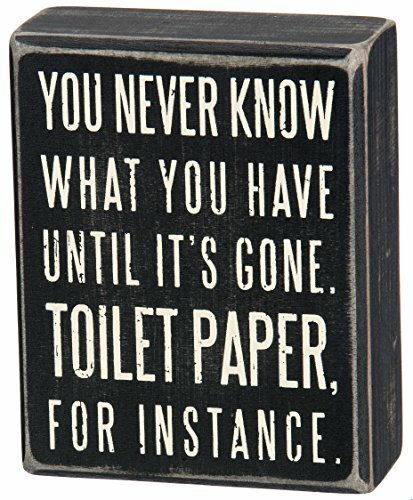 Bring it home and use it for birthdays, anniversaries, weddings, movie nights, parties, celebrations, crafts and inspirational quotes. Send messages between your friends and family in your house, or even use it as a fun lamp! Child Safety Design: To avoid the danger of eating or bitting the batteries by mistake,our cinema light box has designed screw on the battery cover in case children take out batteries at will. Celebrate the architectural diversity of London with this detailed LEGO. brick model. The LEGO Architecture Skyline Collection offers models suitable for display in the home and office, and has been developed for all with an interest in travel, architectural culture, history and design. Each set is scaled to give an accurate representation of the comparative size of each structure, with true-to-life color depiction. 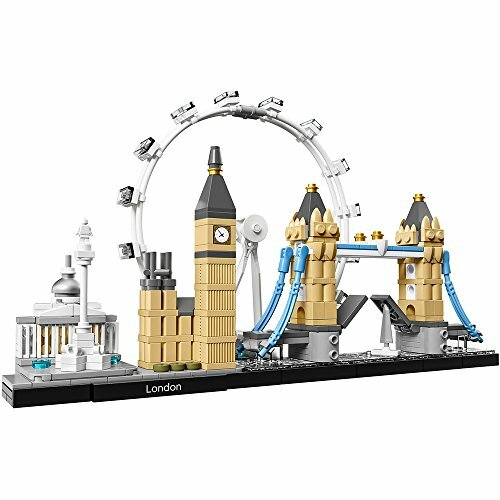 This building blocks set depicts the National Gallery, Nelson s Column, London Eye, Big Ben (the Elizabeth Tower) and Tower Bridge, and is finished with a decorative London nameplate, making it a great gift idea for young and old. P Graham Dunn plaques are proudly made in Ohio in the USA from quality wood materials and prints. Each plaque is designed and produced in the USA. It has a covenient hanger or slot on the back of the plaque for hanging. Each plaque features a bible verse or words of inspiration for life. VALUE FOR MONEY - Not just a girls jewelry box, the musical boxes contains unicorn jewelry sets, making it the 3-in-1 choice for Unicorn gifts for girls, offering more value than others. SPACIOUS - You'll be surprised how much childrens jewelry the box will hold. Includes a special compartment for those unicorn earrings and rings and a additional drawer to keep those secrets safe! BUILT TO LAST- A kids jewelry box should be built to last and grow with them and so we make our box with Medium Density Fibre (MDF) from pine trees instead of cardboard as do others. The kids jewelry is made of Nickel free stainless steel that wont tarnish or leave green marks on the skin- perfect for sensitive skins. WOW FACTOR - You'll love the reaction you get when your little one opens one of these music boxes for the first time and gets lost in a magical world of unicorns and the timeless classic 'Somewhere over the Rainbow' tune. BEAUTIFUL DESIGN - Designed by an artist in Maryland, our music boxes come with an exclusive rainbow unicorn design backed by soft blues, pinks and gold glitter layers. 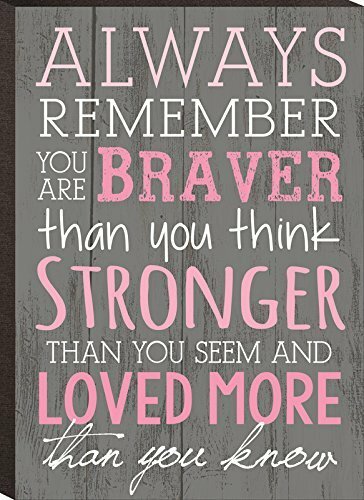 Little ones will love the sparkly girls' bracelets and the 3mm soft white pearl cute necklace with inspirational 'She Believed She Could so She Did' message. 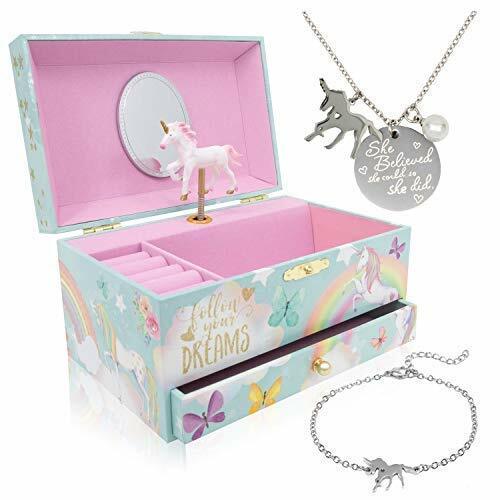 UNLIKE OTHERS, you'll get a beautiful unicorn music box, a unicorn necklace AND a unicorn bracelet for the price of other jewelry boxes alone! With the little girls jewelry tucked inside, there's no need to keep shopping as you will have 3 individual birthday gifts for girls presented in one beautiful gift box. WOW MOMENT - You'll love the reaction you'll get when gifting this. We love to see the open mouths, gasps and wonder as little ones get lost in their new magical world of unicorn stuff, while listening to the timeless 'Somewhere over the Rainbow' tune. FINE QUALITY - Unlike other little girl necklaces and girls bracelets, your little girl jewelry set is fully adjustable. Its strong links and clasps are made of 100% nickel-free stainless steel. At the heart of your Unicorn Jewelry Box is a special silver-plated iron music box mechanism which will keep the tune rolling for years to come. BEAUTIFUL DESIGN - Designed by a Maryland artist, the soft rainbow watercolors of your musical jewelry box will compliment the cutest unicorn decor and sit beautifully among the inevitable collection of unicorn toys and girl stuff in their room! OUR ETHOS - A US-based family business, with a mission to create original, high quality yet affordable girls toys that grow with them and create memorable moments. As busy parents ourselves we commit to offer the best value for money and top-notch speedy customer service you can count on. Grab this fantastic jewelry box for girls as one of your unicorn gifts now! Warranty: Manufacturer warranty: we will replace/refund any items within 30 days of purchase, no questions asked. For items beyond the 30 days window previously stated we will replace any items that encounter any kind of issues related to manufacturing: parts and pieces, music mechanism and/or all hardware used in the construction of our music box. This warranty is only applicable when purchased directly from the memory building company and is automatically void when purchasing from unauthorised third party sellers.